Dewey off Mare Island, 1 December 1942. The first USS Dewey, DD 349, was launched 28 July 1934 by Bath Iron Works Corp., Bath, Maine; sponsored by Miss A. M. Dewey, great-grandniece of Admiral Dewey, and commissioned 4 October 1934, Commander H. W. Hill in command. On 18 December 1944, Adm. Halsey’s Third Fleet crossed paths with a typhoon that sank Hull, Monaghan and Spence nearly sank Dewey, Aylwin and Hickox. 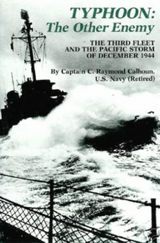 In 1981, Dewey’s then-commanding officer C. Raymond Calhoun wrote Typhoon: The Other Enemy, a definitive account and analysis of her stability problems, her recovery from a sustained roll of more than 75°, the loss of other ships and follow-on events. After two training cruises to Guantánamo Bay, Cuba, and Port-au-Prince, Haiti, Dewey sailed from Norfolk on 1 April 1935 for San Diego, Calif., arriving 14 April. Until 1938 she operated principally from this port on local operations as well as engaging in fleet tactics battle practice, and scheduled exercises. She cruised along the west coast as far north as Alaska and south to Callao, Peru, and made three cruises to the Hawaiian area. From 4 January to 12 April 1939 she returned to the Atlantic for a fleet problem. Dewey arrived at Pearl Harbor 12 October 1939 and participated in tactical exercises, battle practice, fleet problems, and maneuvers until 1941.